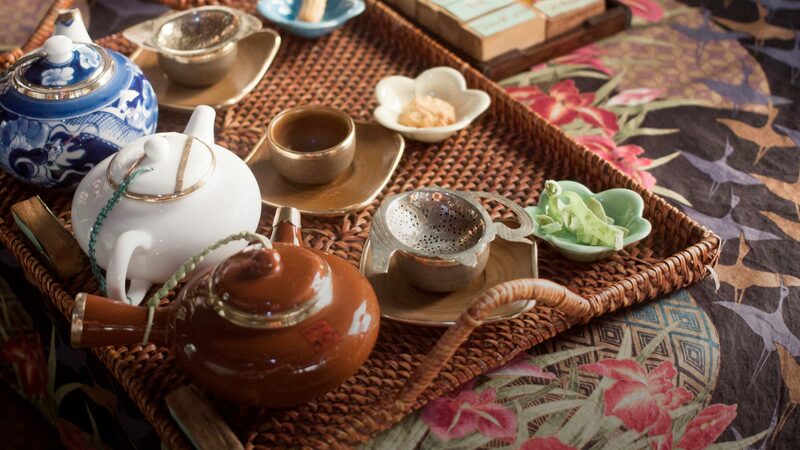 Enjoy the beauty of silence in our tea house, a tranquil oasis in the center of bustling Hoi An. Delicious coffee, tea, fruit juices and biscuits are served in the charming atmosphere of an ancient, tastefully decorated house in the heart of the town. The grace and charm of our speech and hearing impaired staff will warm your heart as you savor the silence of this experience. There are few distractions from the flavors and aromas of our locally grown products. Visitors feel embraced by the traditional Vietnamese tea service. The atmosphere invites quiet contemplation while appreciating the elegance of a classical Vietnamese welcome. Our small garden, children’s quiet play room and formal seating can accomodate up to 40 customers. First visit to the Tea House? Choose 3 varieties from the tea offerings on our menu. The options include Green, Oolong, Jasmine or Organic Herbal tea. Each tea is served in an individual hand made pot and is accompanied by cookies that pair well with the flavors of the teas. Can’t decide which coffee to choose? Try all three in a sample flight. Chicory, Mocha and Arabica are featured. These are also paired with just the right small cookie or treat to enhance the taste experience. Our servers will help you drip your chosen coffee to perfection. Customers love our handmade cookies, cakes and snacks including green tea coconut candy. Each offering is made in-house, fresh daily and are perfect flavour matches for your beverages. The sampler includes several different cookies and treats-enough for 2 people. A pot serves one person. Please feel free to ask for a second fill of boiling water for your tea. Grown on a small farm and hand-processed, this mildly astringent tasting tea offers antioxidant benefits. A traditional Vietnamese welcome tea and a treasured gift, it has a warm, light yellow-green color. From the Central Highlands this organic tea infuses slowly, delivering the best of itself with the second water. The pale, honey-yellow color, light fragrance and delicate floral taste please most palates. Blended with jasmine flowers this fair trade, organically grown tea is a favorite of tea lovers in northern Vietnam. It has a light yellow color, intense floral aroma and a mild astringent note. Caffeine free, this traditional herbal tea (C.operculatus) soothes the stomach. Refreshing in summer, it has a yellow brown color, a woody incense aroma, and an intriguing spicy taste. Choose any 3 tea flavor combinations. Customers who choose this offering will receive a vnd 135,000 voucher on any minimum vnd 1,320,000 purchase of bulk or loose tea and tea accessories from Reaching Out. A handcrafted, organic, high grade coffee, this medium roasted blend of Cau Dat Arabica & Ea H'leo Robusta is sweet with chicory aroma and a long aftertaste. This iconic blend pairs a sundried Dalat Bourbon Arabica with Moka beans. Intense bitter-sweet taste, balanced with strong body and aftertaste. Grown in Cau Dat, Dalat. Vietnam's specialty-grade Arabica coffee is suitable as a brewed coffee, espresso or cold brew and bears notes of toffee, cashews with a light floral aroma. Choose any 3 coffee flavor combinations. 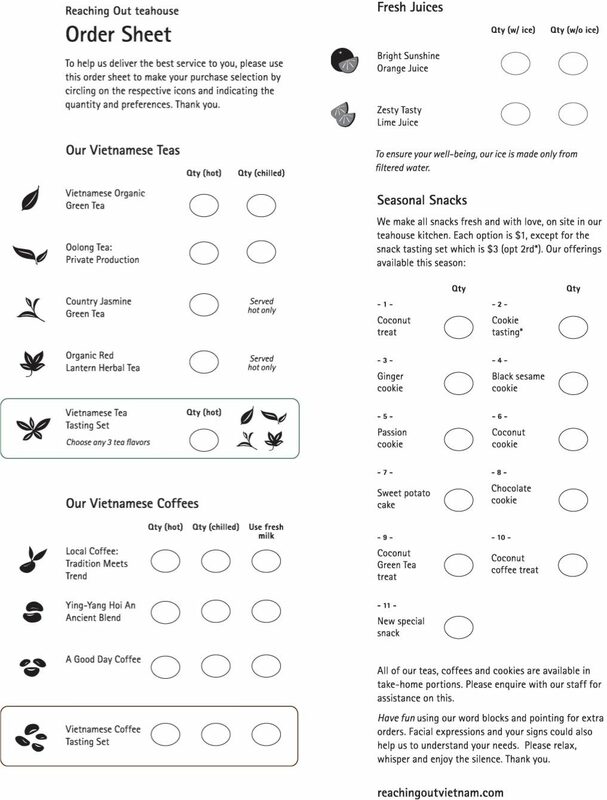 Customers who choose this offering will receive a vnd 135,000 voucher on any minimum vnd 1,320,000 purchase of bulk or loose coffee and coffee accessories from Reaching Out. and rejuvenate after a long day in the sun. Quench your thirst with a glass of freshly squeezed lime juice, served with a choice of syrups to sweeten the tart flavor. Our Teahouse serves a selection of seasonal snacks every day. 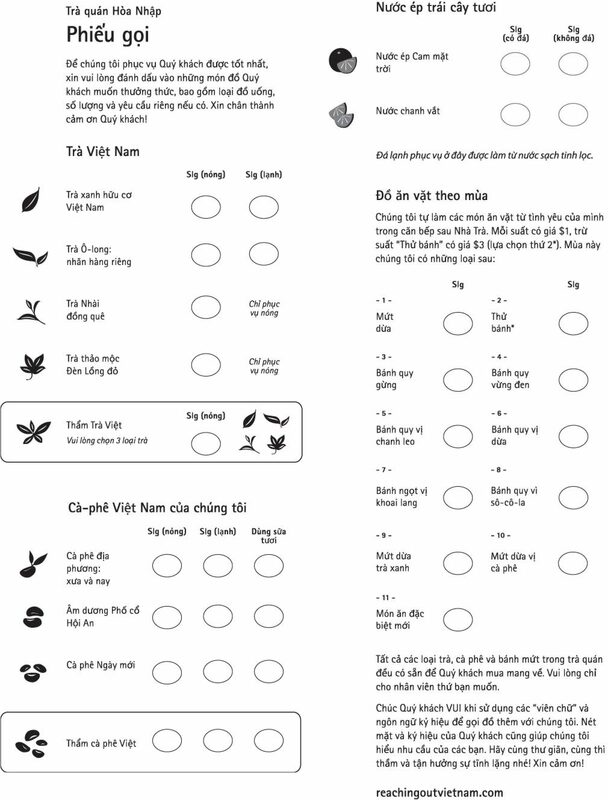 Please refer to our order sheet for available offerings (en|vn).